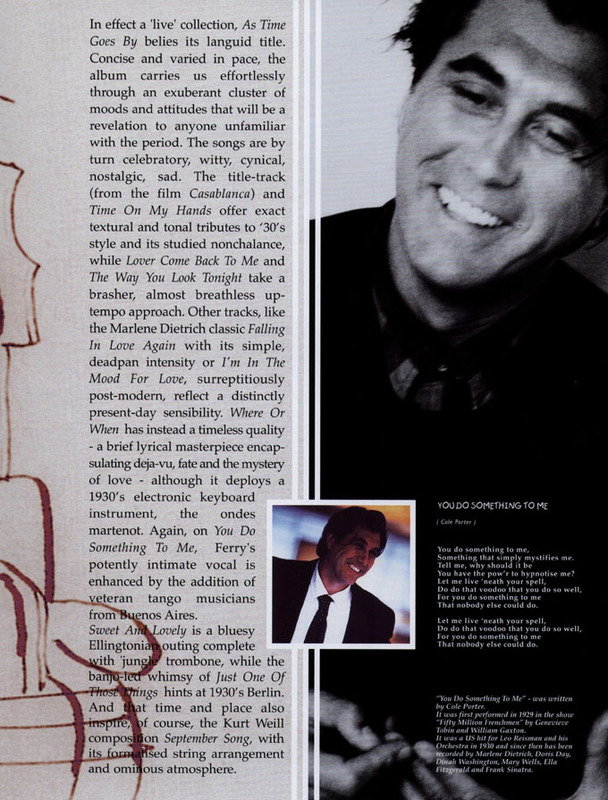 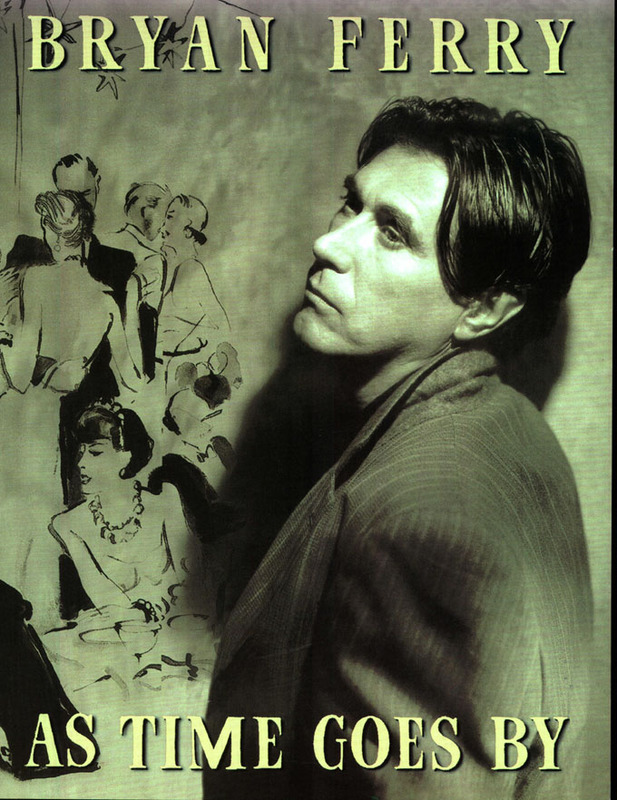 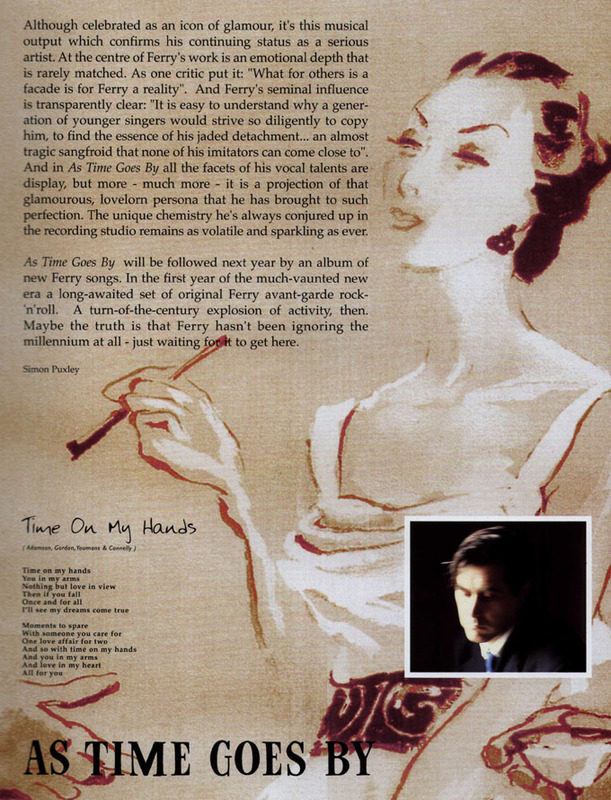 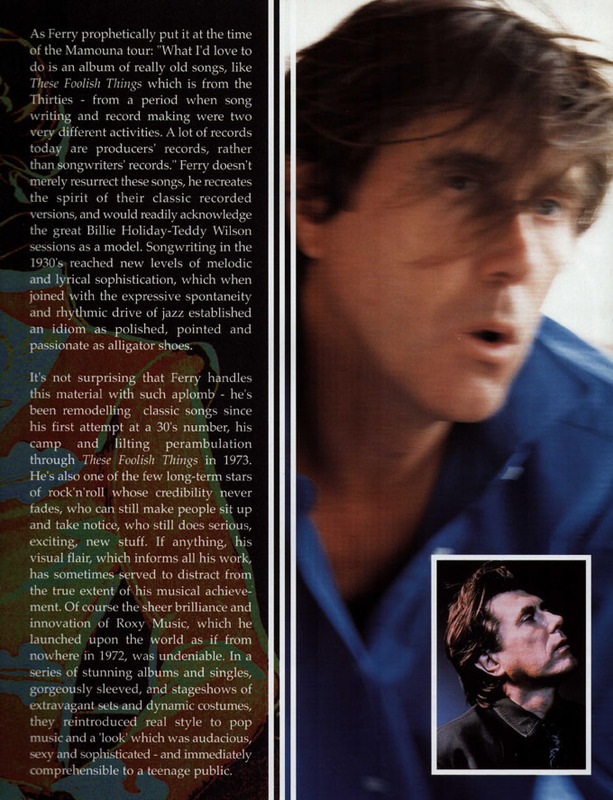 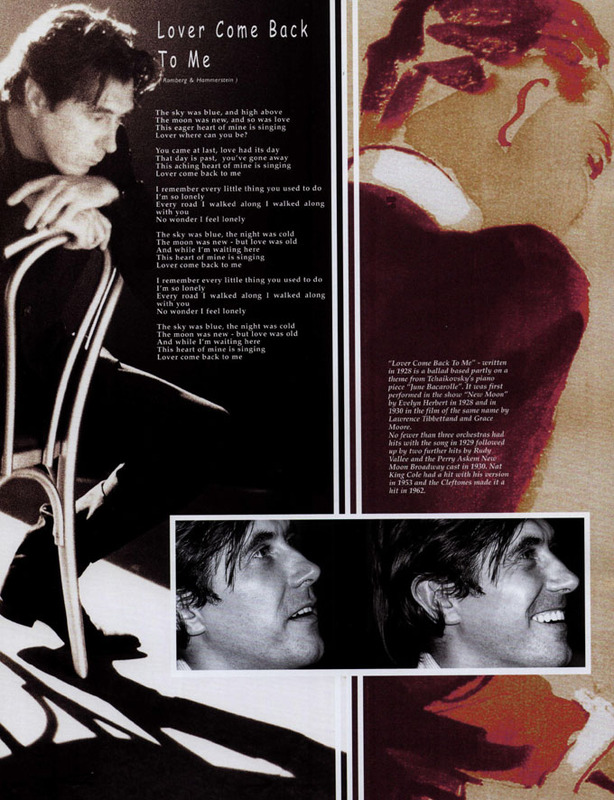 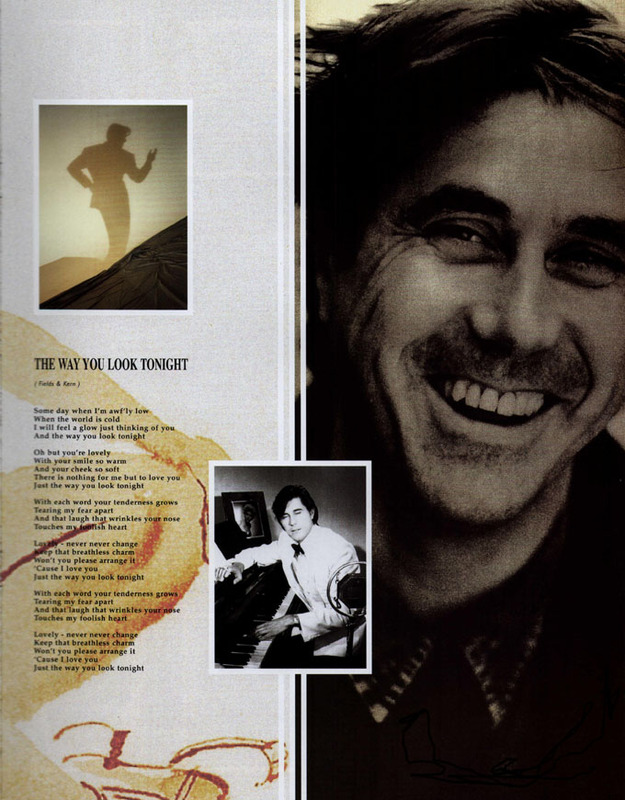 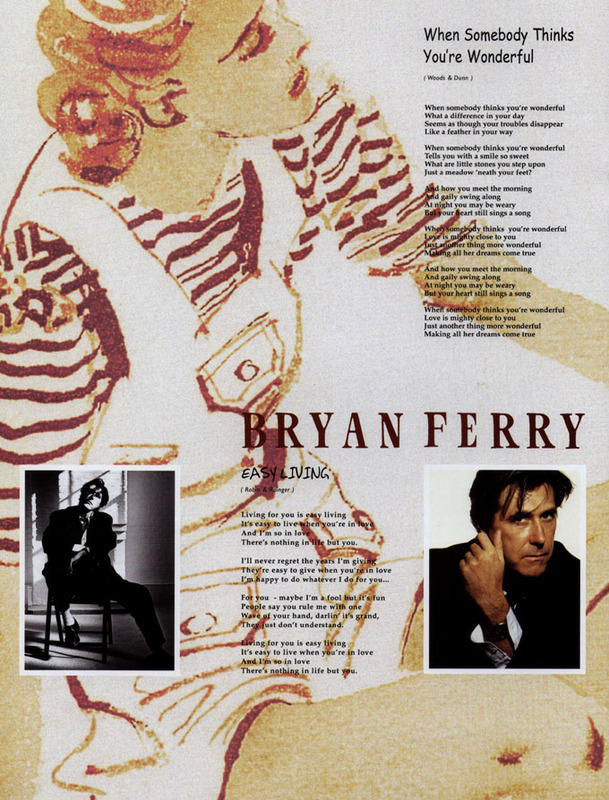 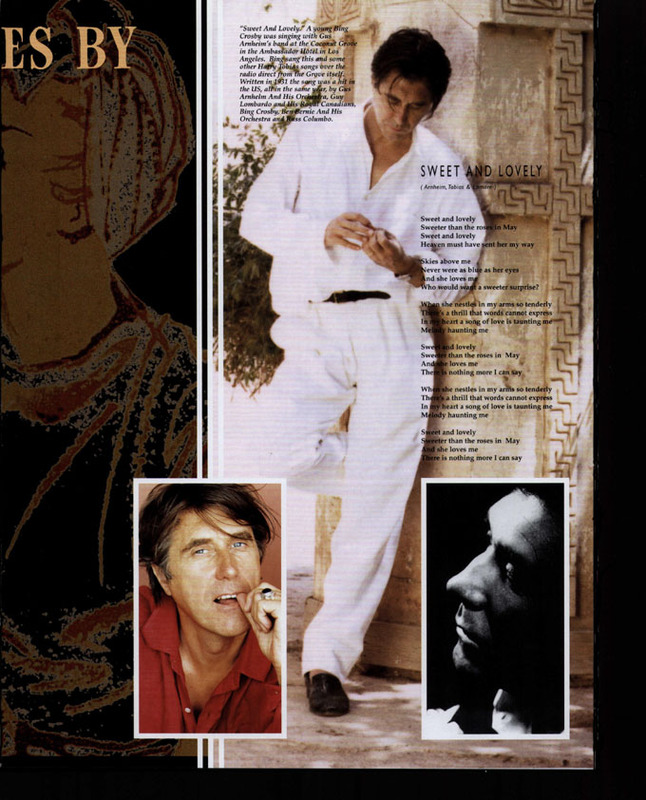 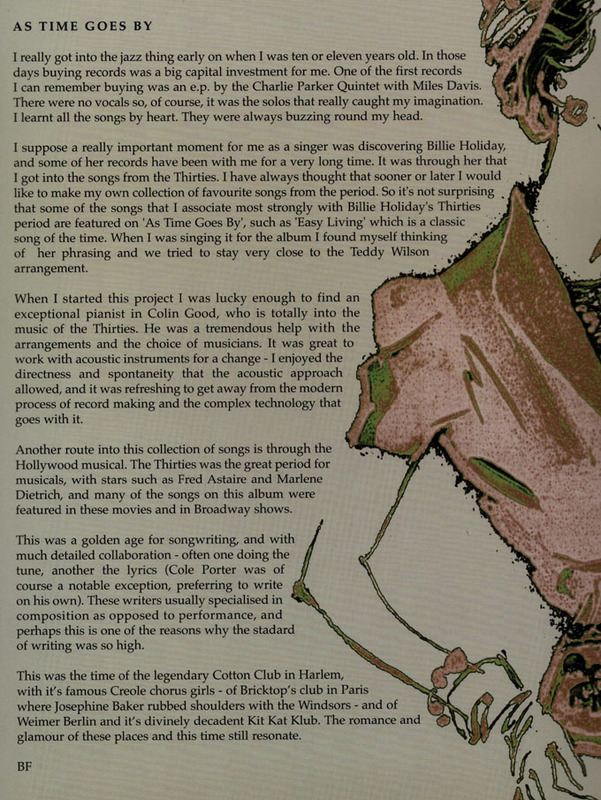 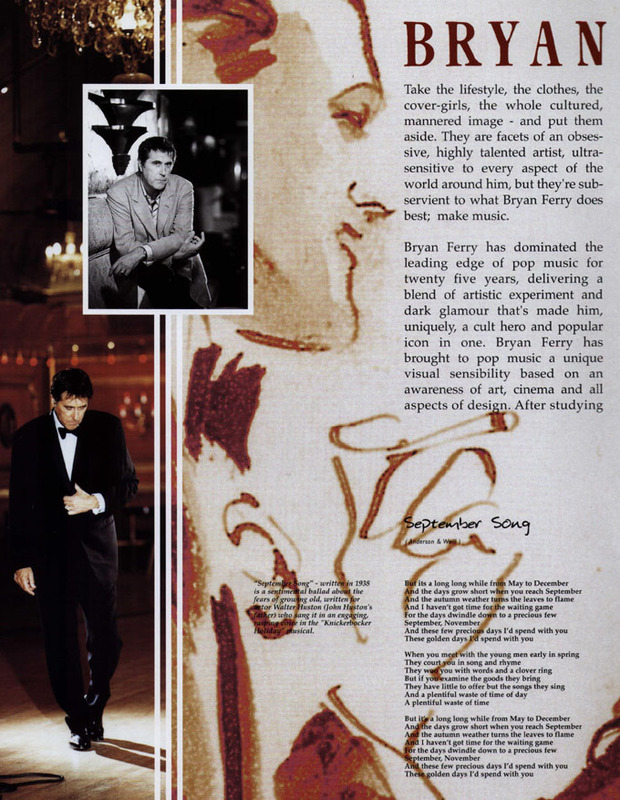 Bryan Ferry started off his As Time Goes By tour in Washington in November 1999 just after the death of his close friend Simon Puxley. 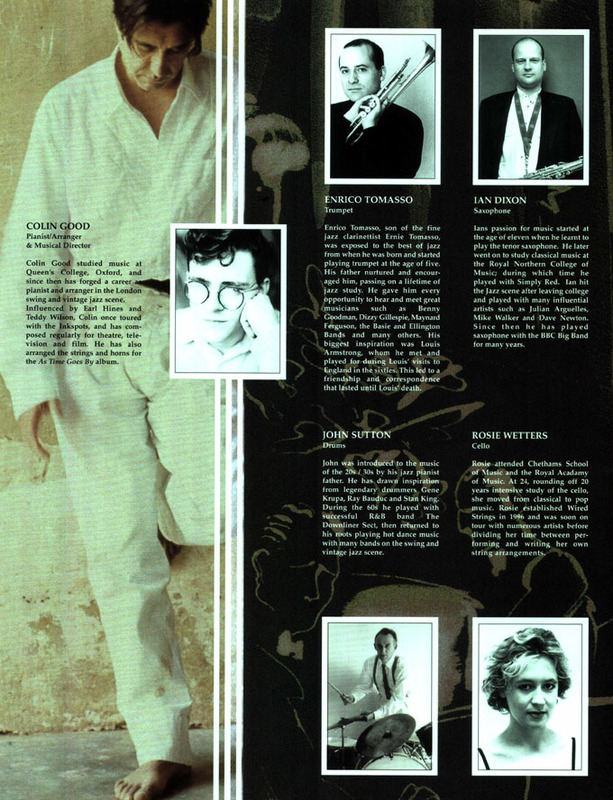 Bassist Richard Jeffries pulled out from the band on the eve of the tour and Zev Katz was taken in at the last minute. 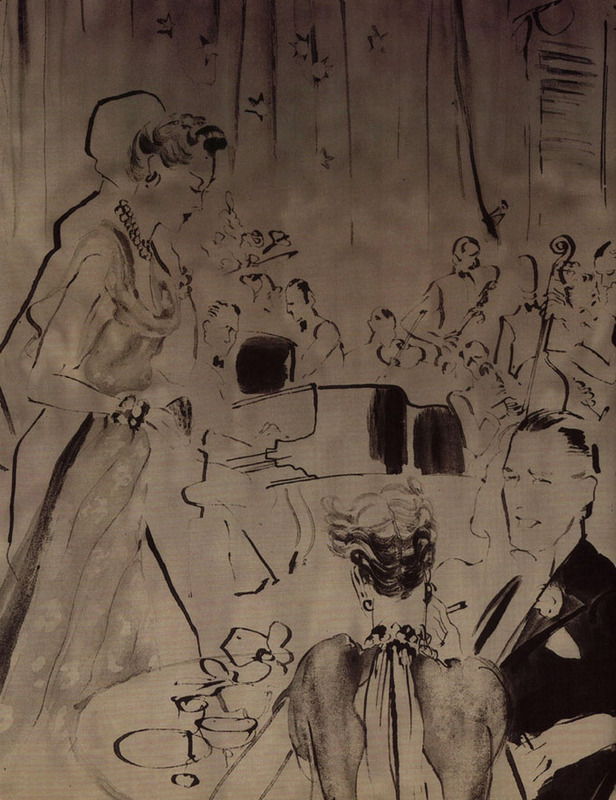 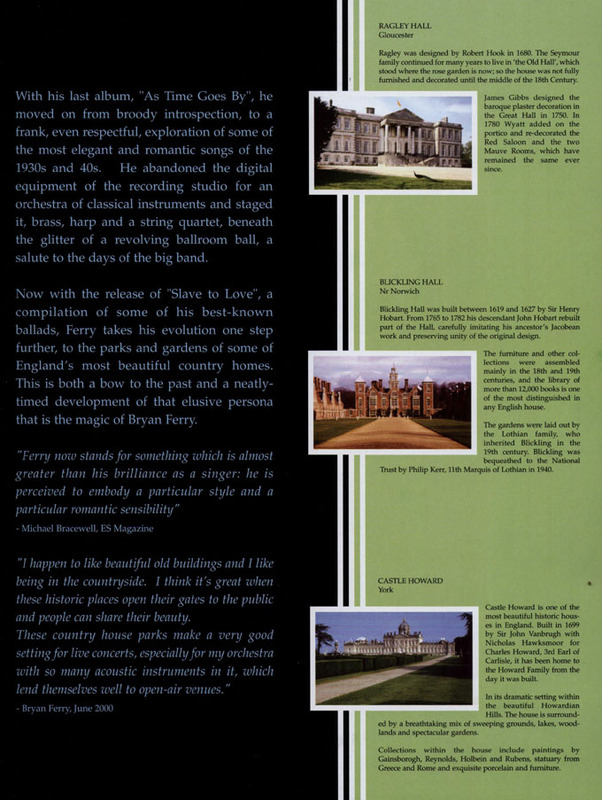 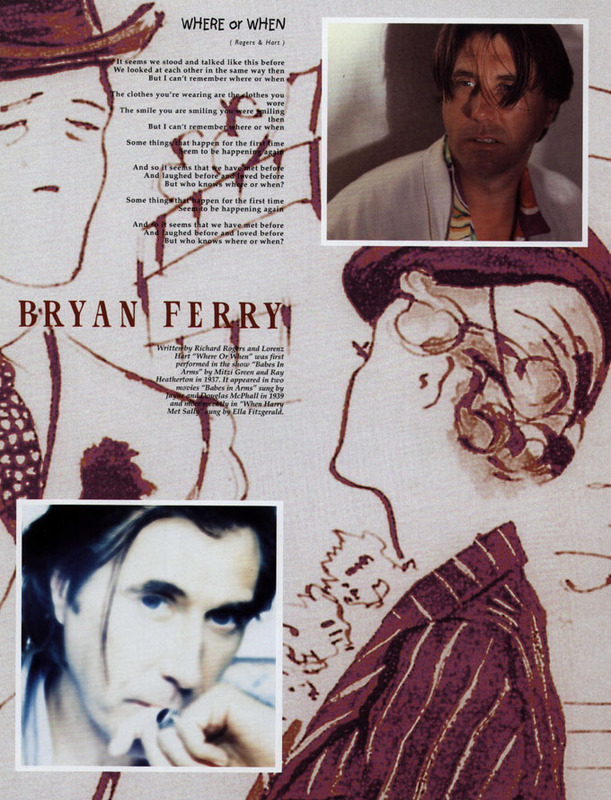 Bryan, for the first time, did several stately homes shows in the summer of 2000 and the tour ended in Russia with Bryan playing in St Petersburg and Moscow. 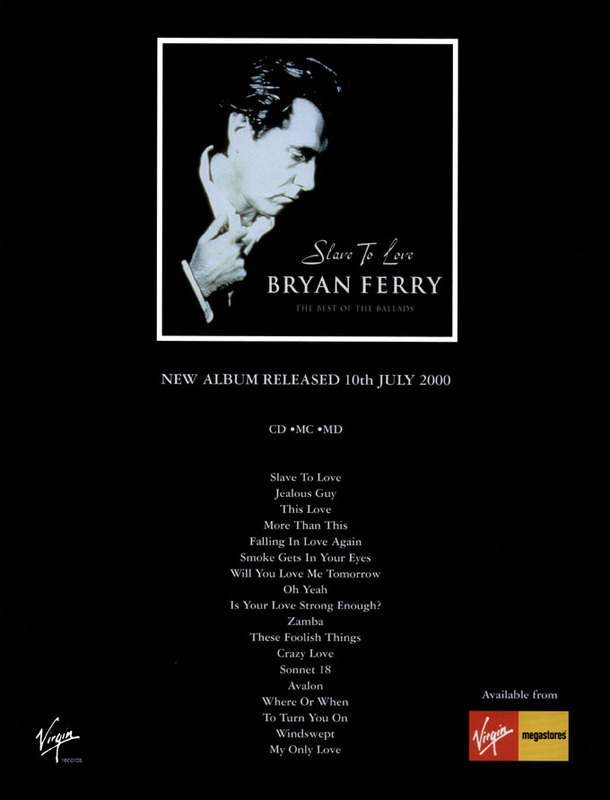 A peformance for radio was recorded in Golders Green London for BBC on 6th December 1999 and Bryan also played in Oslo on 11th December for an awards ceremony. 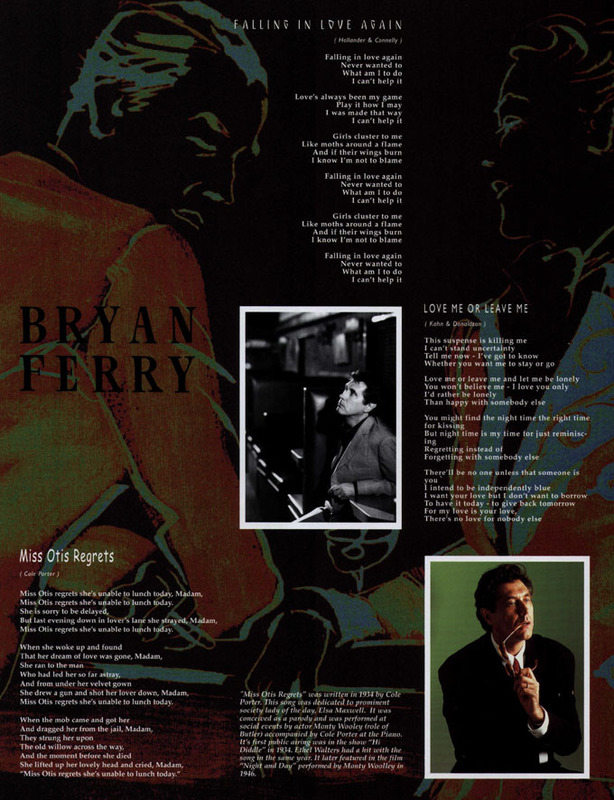 The shows had the unorthodox opening of a Harp solo followd by a string quartet and a band piece before Bryan joined the band on stage. 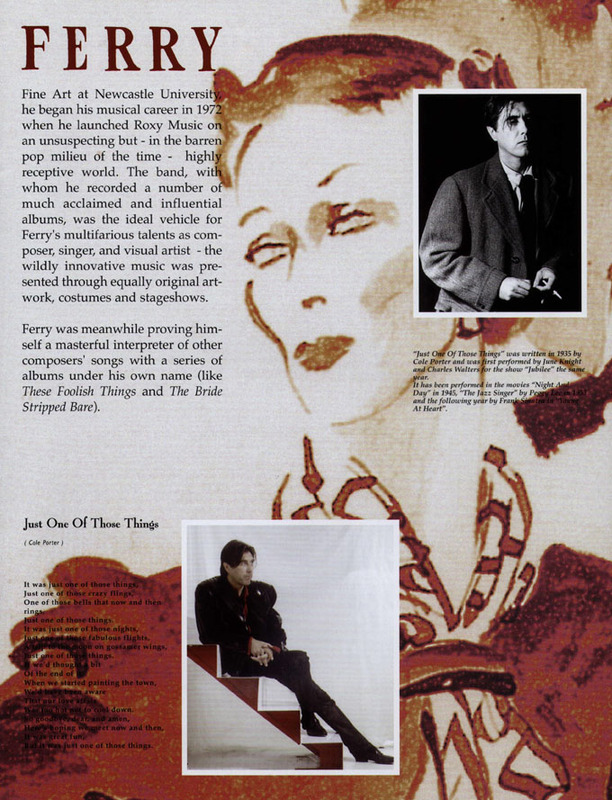 Bryan took an interval mid show where the band would play I'm Fer It Too or Sweet Georgia Brown. 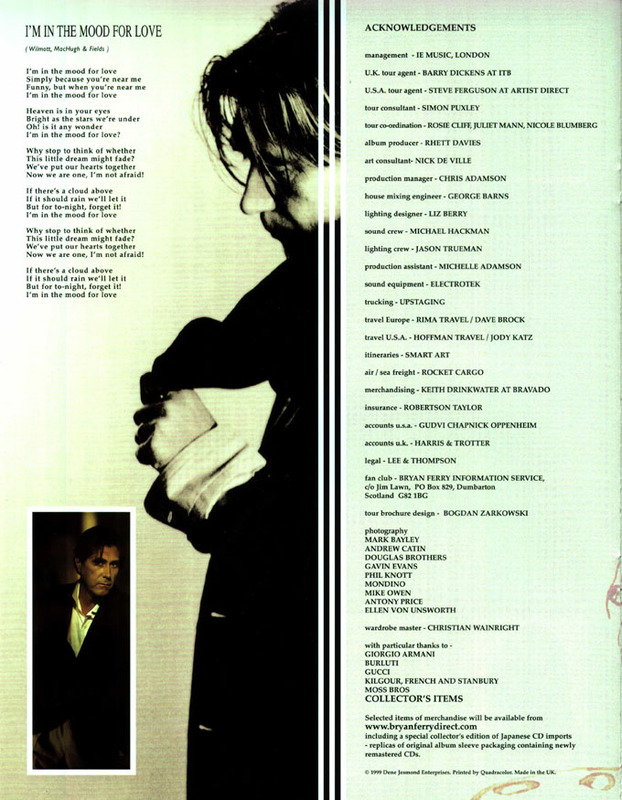 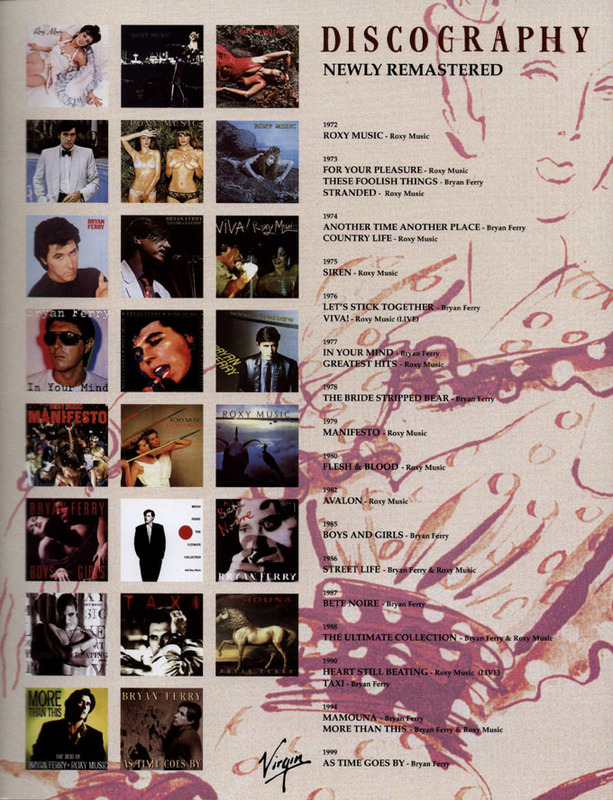 The songs listed below are the songs played on this tour, usually 22-25 per show. 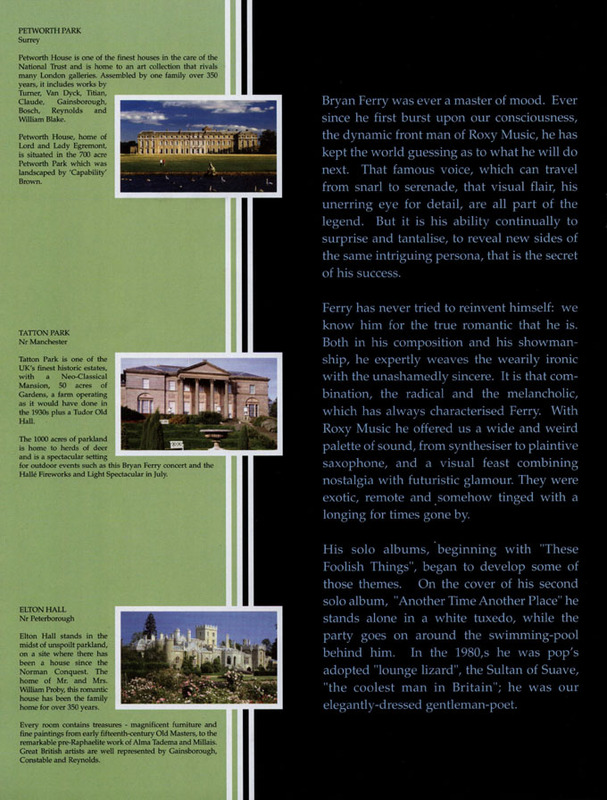 The initial dates in USA had predominantly material from the As Time Goes By album but by the time the summer shows came in UK the show had evolved to being mostly from the Ferry/Roxy back catalouge. 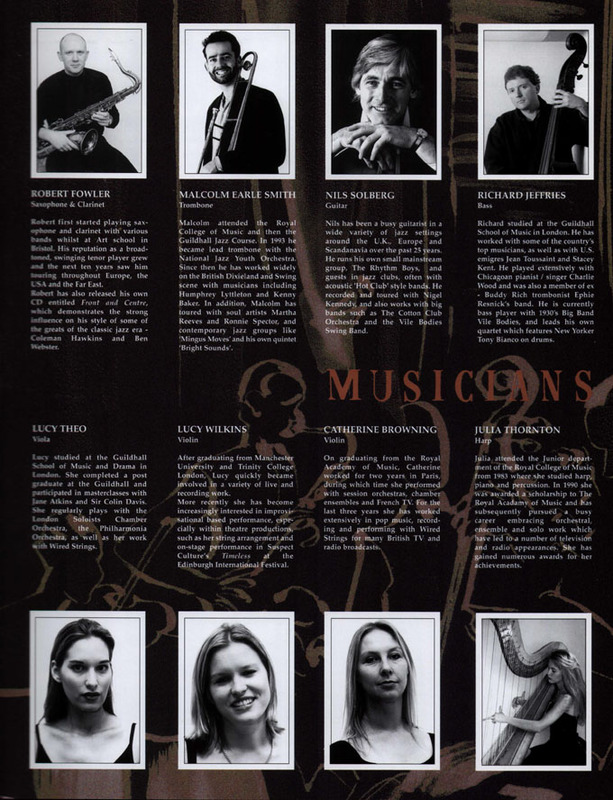 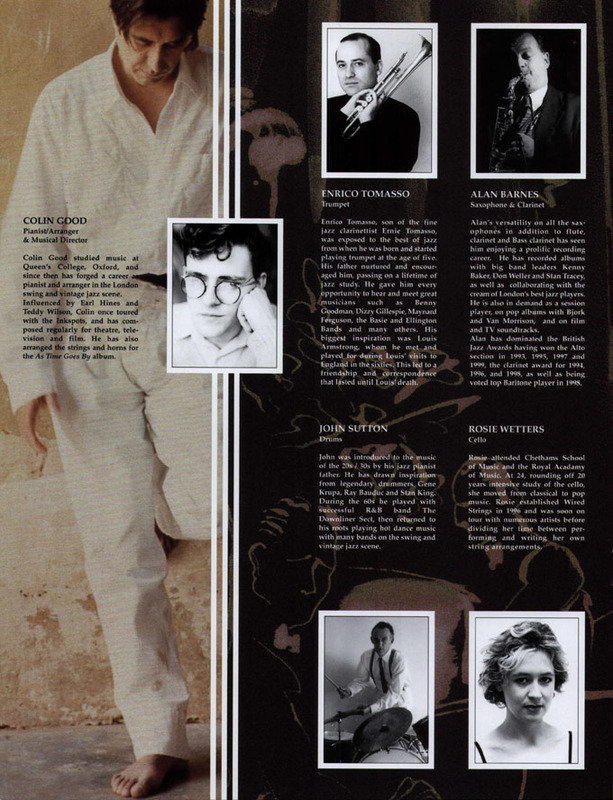 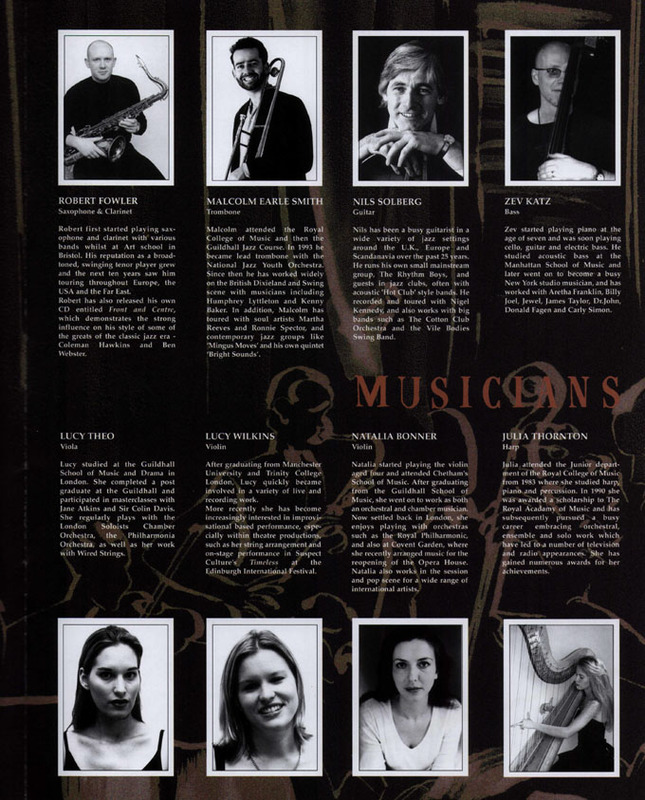 The band used 4 from the 7 string players listed per show and Ian Dixon replaced Alan Barnes for the 2000 leg of the tour. 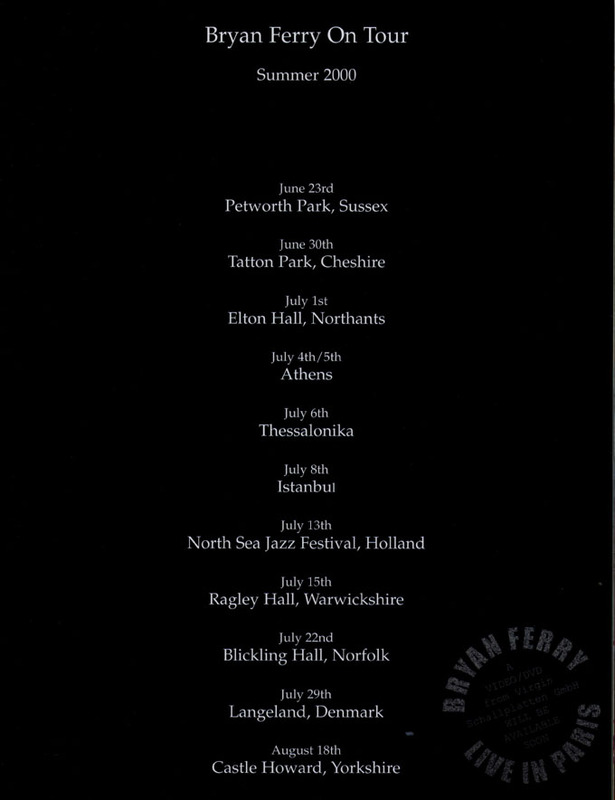 Zev Katz was replaced for the Castle Howard due to an outstanding commitment but returned for the final 2 dates in Russia. 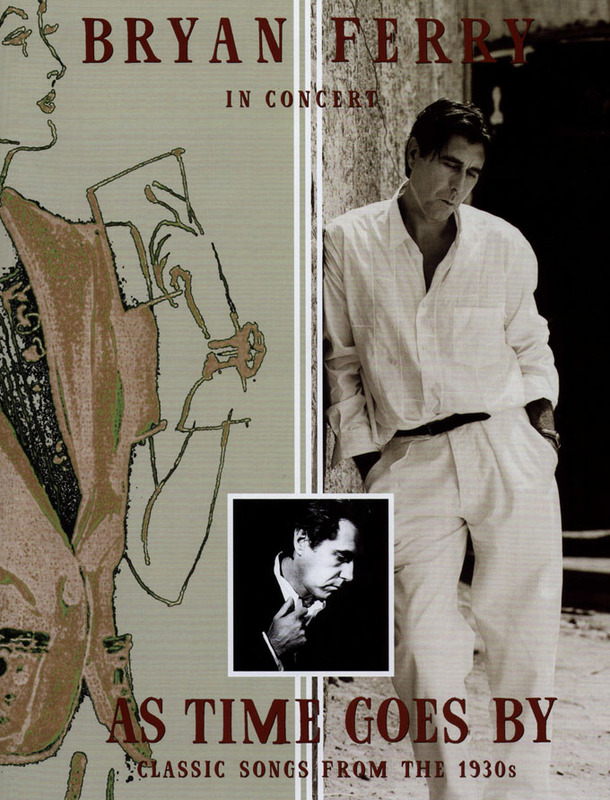 The Paris show was filmed and is available on DVD.